It's CASEd from Teneale Williams. I had pinned this off Pinterest thinking it would be great for a quick and cute class so I simplified it a tad by not sponging anything. I still like the original better, but this one is a close second. 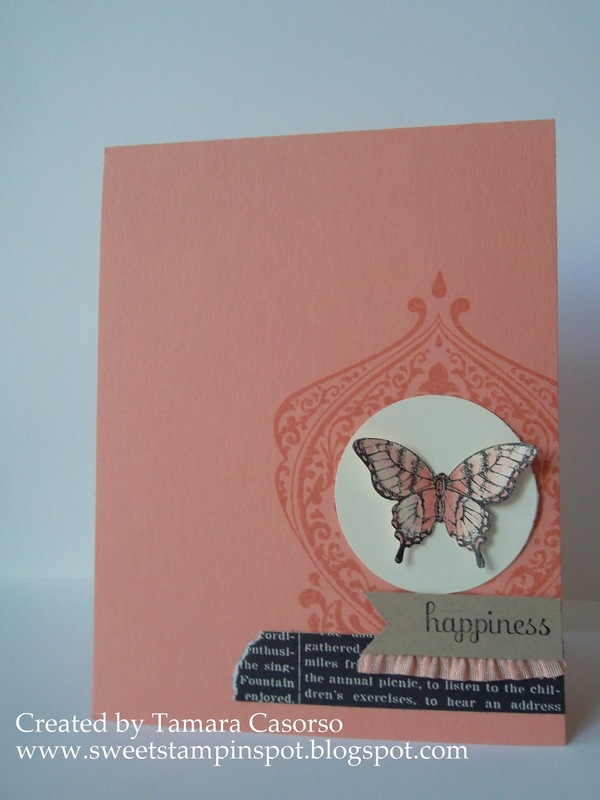 The butterfly is stamped in Jet Black StazOn ink and then I used a blender pen to colour it in using the lid of the Crisp Cantaloupe ink pad. I let it dry briefly and added another layer of CC ink to intensify it. The "happiness" stamp is from a word set called Fabulous Phrases. It's great as there are lots of words and you can use them separately or create, well, phrases. Hope you've got a fun weekend planned! If it's rainy, CASE something from Pinterest. It's a great way to get out of a stamping slump!